In March, The Chronicle of Higher Education trained a light on a discouraging recent trend. "Attrition is rampant," reported the Chronicle. "Nationally, only 58 percent of all first-time students who started a two- or four-year college in fall 2012 returned to the same institution the following year... [only] 69 percent returned to any college. That's a ton of missed opportunities — and lost tuition revenue." 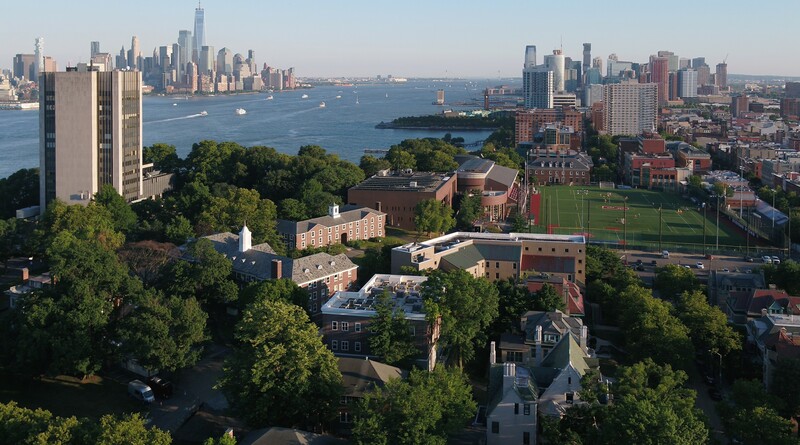 Determined to tackle this new environment and bridge the digital gap, while still keeping its graduate and undergraduate students at the center of the learning experience, Stevens has responded with technology and ingenuity to teach differently and more effectively. "I think we all understand, especially at a place like Stevens, that the 21st century is a century of technology, the century of innovation," noted former Intel CEO Craig Barrett, speaking at Stevens in 2014. During the past year alone, the university has rebooted its physical campus, equipping faculty and students with the latest digital tools with which to teach and learn. Stevens created and launched the Stevens Virtual Learning Environment last fall, a technical breakthrough available at only a handful of universities nationwide. And many additional innovative teaching technologies and curricular innovations are also being deployed and tested across campus — many developed at, and unique to, Stevens. These innovations complement a rising trend of excellence — the university's freshman retention rate (94 percent) and within-six-year graduation rate (82 percent) are stronger than at any time in the institution's history — and further cement Stevens' powerful commitment to fueling student success, a central tenet of the university's Strategic Plan, The Future. Ours to Create. "We are making significant headway in developing powerful new teaching technologies, ideas, tools and methods," notes Provost and University Vice President George Korfiatis. "Our faculty are pushing the frontiers of development in several specific areas, and we are making great strides toward becoming a leader in a digital age." Calculus is a difficult subject. To fight attrition and boost learning retention, Stevens has forged a two-pronged strategy: high tech plus new ways of teaching. Specially-paced course sections made available to students who had not been sufficiently exposed to calculus in high school. Each calculus course has been split into half-semester modules to make the material more digestible. Instructors distribute "clickers" (small handheld transmitters) during lectures; students feed live answers to math problems to the instructor, allowing discussions to pivot in real time to poorly-understood concepts. Some problems are now also tackled workshop-style, in groups, by the students. Gradarius, a revolutionary new software platform invented at Stevens by faculty members Alexei Miasnikov and Aleksey Myasnikov, is also making a difference. The new platform manages homework, administers and grades quizzes, monitors self-study and provides meaningful feedback — showing how a solution might be partially correct and hinting at new pathways to complete it, for instance. Student retention, grades and retention of calculus knowledge have soared since the new strategy was implemented. Five years ago, one in three Stevens calculus students received grades of D or F, or withdrew entirely from a calculus course without credit. Today, far fewer calculus students (about 15 percent) fall into these categories. And since Gradarius was rolled out 18 months ago, students attaining A's have nearly tripled while the number receiving D's or F's decreased by half. Theodoros "Ted" Lappas, a professor of information systems in the School of Business, teaches a rigorous graduate course in data analytics to approximately 90 students per semester. "This is a technical course," explains Lappas, "in which students must code daily in languages such as Python. Some students begin the course very far ahead of others." To help students learn and help each other learn, Lappas and postdoctoral researcher Georgios Valkanas created IRIS (Interactively Refined Instructional System). Still in the testing and development phase, IRIS delivers resources such as videos, web pages and question-and-answer forums to students working software-coding problems. It works like this: Students receive rewards for creating resources and links as they work, and for evaluating the helpfulness of others' links and resources. Then, using an algorithm, IRIS propagates the most useful resources during future queries. The software can even personalize the resources delivered to each student based on usage history, problem-solving history and additional factors. The system feeds back data to instructors, who can adjust lectures and quizzes to target problem areas, notes Lappas. Stevens is also changing the way in which courses are conceived of and taught. In September, Stevens was awarded $2.8 million by the National Science Foundation's (NSF) Improving Undergraduate STEM Education program to help faculty learn to adapt their teaching of STEM topics — particularly introductory courses in core topics such as mathematics, science, and engineering taken during the freshman and sophomore years — to more active, student-centered approaches that research shows can lead to deeper, more transferable learning. The five-year project will create a Foundations Program, led by Associate Dean of Engineering & Science Keith Sheppard, who will work with colleagues in the School of Business, Department of Mechanical Engineering, Center for Innovation in Engineering & Science Education (CIESE), Office of Diversity & Inclusion and Office of the Provost. Columbia University's Teachers College will also contribute to the research and evaluation components of the project. The new program will work to implement new, 'evidence-based' teaching approaches that can increase student engagement and improve outcomes; include original research to measure and examine these methods' effectiveness; and recognize and reward faculty and instructors who implement the new approaches. Stevens also continues to offer unique coursework and curricula aimed at teaching students to think more broadly and creatively. A pilot course, Introduction to Entrepreneurial Thinking, has operated successfully in the School of Business since 2013. The course, taught by innovation expert Peter Koen and ten fellow faculty, challenges freshmen engineering students to think outside the box, develop new ideas and solve problems just as they are stepping into the university experience. It's one of only two such undergraduate courses in the nation. "Many of our students may not wish to become entrepreneurs, but that is not the goal here," explains Koen. "An increasing volume of research shows that entrepreneurial thinking, even within large organizations, can and does transform those organizations' strategies and success in innovating new ideas and products." In addition to the experience of pitching ideas to classmates Shark Tank-style, there's also a new interactive self-study module on oral communication. And Stevens will also take additional steps to integrate innovation and entrepreneurship into its curricula: beginning in 2016, the university will further weave design innovation and entrepreneurial thinking into curricular and co-curricular experiences. One key actor in that process will be the new IDEaS (Innovation Design & Entrepreneurship at Stevens) program. Directed by mechanical engineering professor Kishore Pochiraju, IDEaS will develop curricular- and project-focused learning modules at the same time engineering and science coursework is being developed. "IDEaS will coordinate these activities and work toward adding new offerings during the sophomore and junior years," says Pochiraju, "in an effort to create an 'innovation spine' that focuses on problem definition based on customer research; identification of entrepreneurial and business value propositions for research; and design projects and elements of starting up businesses."